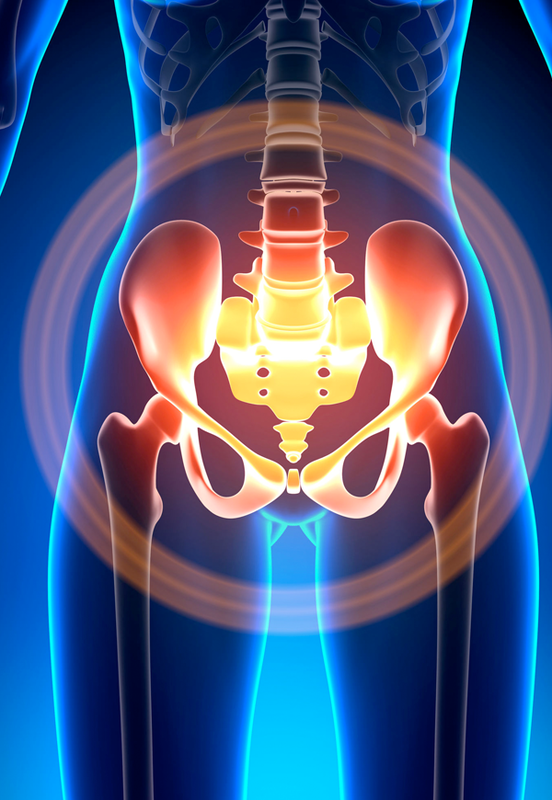 Pelvic pain is described as pain in the lower abdomen, low back, pelvis, or pelvic floor. The pain may be described as aching or burning in the area of the pelvic floor or lower abdomen but can vary with every person. All pelvic floor muscles connect to spine, pelvis or hip. Common diagnosis such as back or hip pain can only be partially corrected in some cases because pelvic floor is often overlooked. the muscles related to bowel and bladder function, active trigger points in the muscles of the pelvic floor, nerve entrapment in the pelvis, and weakness in the muscles of the pelvis and pelvic floor. Pelvic pain can also be related to the presence of scar tissue after abdominal, C-section, or pelvic surgery. Pregnancy can cause a wide array of problems in the pelvic floor, hips, back depending on position/pressure of the baby as well after delivery when the muscles are strained, or significant scarring is present due to tearing. There can be other reasons related to pelvic pain therefore it is important to consult your physician to eliminate other sources. Stress/urge incontinence, vulvodynia, prostatitis, coccydynia, constipation, pudendal neuralgia, post pregnancy muscle strain/scarring/pain, prenatal care, endometriosis, sexual dysfunction, testicular pain, post-surgical or c-section scar release, prolapse, unresolved back/hip pain, groin pain, abdominal pain, and SI joint pain. We complete a thorough exam to determine cause of pain and use a multisystem approach in treating pelvic pain. Our treatment philosophy is going from the outside in to correct the dysfunction. We utilize many manual techniques to address limitations such as myofascial release, trigger point release, muscle retraining, muscle energy, cupping, dry needling, and strengthening/retraining the weaker or uncoordinated muscles. Call any of the 3 offices to see if we can help achieve a better you! "Just over 2 weeks after my first visit with you I am almost completely relieved of the discomfort that has bedeviled me for too long."